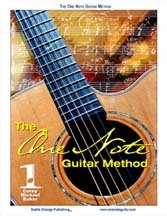 The One Note Guitar Method is more than just another ear-training course. Beginners are first taught to identify the chords, and find and play any note on the guitar. Once a student understands just one note within a chord, they quickly become familiar with how that one note sounds within the chord and soon how that chord sounds in relation to the other chords. This leads to a familiarity with the different chords and how each chord sounds in relation to the others. Once a student can identify the chord progressions -- that is a series of chords played in succession -- that student can play any song alone or jam for hours with any group. This simple concept has allowed dozens of Corey’s students to attain an entire catalog of notes, chords and songs quickly and easily. Click on a page above to view.